Associate Professor Reza Ghodssi (ECE/ISR) and Professor Gary Rubloff (ECE/ISR/MSE) are two of the inventors named on U.S. Patent 7,375,404, "Fabrication and integration of Polymeric bioMEMS." Other inventors listed include Jung Jin Park, Mark Kastantin, Sheng Li, Li-Qun Wu, Hyunmin Yi and Theresa Valendine. Ghodssi was the principal investigator on the project that led to the patent. The patent is jointly assigned to the University of Maryland and the University of Maryland Biotechnology Institute in Baltimore. The invention is a micro-electro-mechanical system (MEMS) device for microfluidic and/or biomicrofluidic applications. The means for the device's fabrication and operation is also provided in the patent. The MEMS device includes a substrate, optional electrodes, a patterned structure with a fluidic microchannel aligned with one or more of the optional electrodes, an encapsulation membrane covering the microchannel, and an optional reactive layer deposited over the electrode in the microchannel. A leak-tight seal is formed around the microchannel and fluidic interconnects for robust operation of fluidics-based processes. 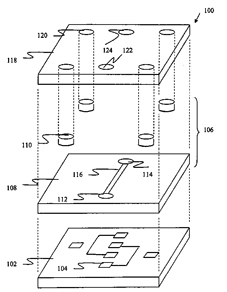 MEMS devices of other preferred embodiments permit reversible attachment and separation of the encapsulation membrane relative to the patterned structure. Ghodssi is the Herbert Rabin Distinguished Professor in the Clark School of Engineering. Rubloff is the director of the Maryland Nancenter and a former director of ISR.